Following yesterday's post on the Association of Autonomous Astronauts, I am starting a series of posts of space sounds. 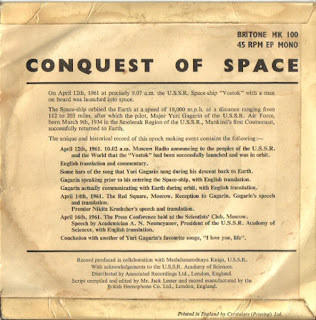 Pride of place in my cosmic record collection is this 7 inch from 1961, Conquest of Space, released to commemorate the first trip by a human into outer space by Yuri Gagarin on 12th April. 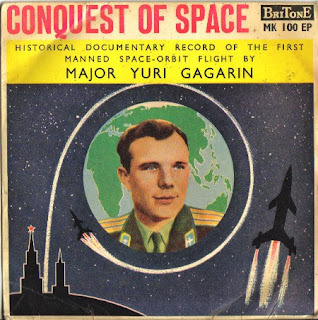 It includes recordings of Gagarin entering the spaceship ("In a few minutes I shall be launched into outer space in a powerful cosmic ship") and from the trip itself, not to mention some bars of the song that Yuri Gagarin sang during his return to earth - the first song to be sung in space (apparently it was The Motherland Hears, the Motherland Knows, tune by Shostakovich) . Unfortunately its not actually Gagarin's version on the record. Obviously the record is very much a project of the Cold War, complete with a speech by Krushchev and Gagarin thanking the Central Committee of the Communist Party of the Soviet Union. But it is an also an artifact of a more optimistic period in which human subjectivity seemed to be expanding and the Situationist International declared that 'Humanity will enter into space to make the universe the playground of the last revolt: that which will go against the limitations imposed by nature. Once the walls have been smashed that now separate people from science, the conquest of space will no longer be an economic or military “promotional” gimmick, but the blossoming of human freedoms and fulfilments, attained by a race of gods. We will not enter into space as employees of an astronautic administration or as “volunteers” of a state project, but as masters without slaves reviewing their domains: the entire universe pillaged for the workers councils' (I'm not sure about the pillaging bit, but agree with the spirit). Well so far the future hasn't worked out as planned - no leisure society, no moonbase alpha -but some of us are still hopeful. Last week -pub quiz in Kenmare Co. Kerry - question comes up: first song in space? I said 'The International' Gagarin must have sung it - someone suggests 'Happy Birthday' we go with the the banal - but I still know the First Man in the Firmament must have sung - if the brave bugger could breath. Anyway, quiz mistress confirms the pub quiz dominance of US culture 'Happy Birthday' - US imperialism wins. Thank you, now we know it's 'The Motherland Hears, the Motherland Knows'. HI There. Thanks a lot for this. The blog is great.. I have a couple of quick questions: Does it say on the record (conquest of space) whose voice it is that is commenting in English? And was that track from some sort of a radio programme aired in the US, or, if not what/where? I would very much appreciate your help..
Hi Rana, if you click on the image of the record sleeve you can read it. It doesn't say the name of the commentator, but it suggests that it was a broadcast on Radio Moscow. I believe during the Soviet era they did broadcast an international English language radio station which could be picked up in most parts of the world. However it is possible that the English translation was made especially for the record.